This Friday is Nov. 11, 2011 (aka 11/11/11). Or, to put it another way, it's Nigel Tufnel Day. Enthusiasts of loud (if not necessarily critically acclaimed) music know all about Tufnel. He's the fictional rocker from the semifictional band Spinal Tap who loves to turn his amps up to 11 when he needs that "extra push over the cliff." What better time to celebrate and salute the man and his technique than on 11/11/11? We first learned of the unofficial holiday through Facebook, where folks are preparing to honor the great guitarist. One fan writes, "Friday, in Honor if Nigel Tufnel Day and Veterans Day, I will be turning it up to 11 and rocking the Star-Spangled banner." Web searches on the holiday are on the rise, jumping 20% over the past 24 hours. Tufnel, played by comedy legend Christopher Guest in the 1984 mockumentary "This Is Spinal Tap," is one of three main characters in the film. 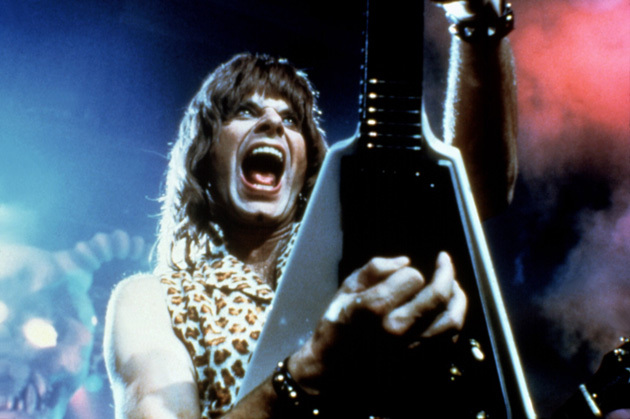 Lead singer David St. Hubbins was played by Michael McKean, and bassist Derek Smalls was played by "Simpsons" voice actor Harry Shearer. Tufnel isn't particularly bright, but what he lacks in smarts he more than makes up for in his love of (loud) music. The film, which was directed by Rob Reiner, helped create the mockumentary genre. Guest went on to star in and direct several well-received mockumentaries, including "Waiting for Guffman," "Best in Show," and "For Your Consideration." So, what does one do on Nigel Tufnel Day? We're not too sure, but we'd like to imagine it's a day to do whatever you normally do -- only do it a little better. Take a look at your regular chores, your job, your schoolwork, and crank your enthusiasm up to 11. Extreme elevenness, that's the goal. Oh, and play a lot of loud music, too.